Keloid is an overgrowth of the scar tissue that develops around a wound, usually after the wound has healed. 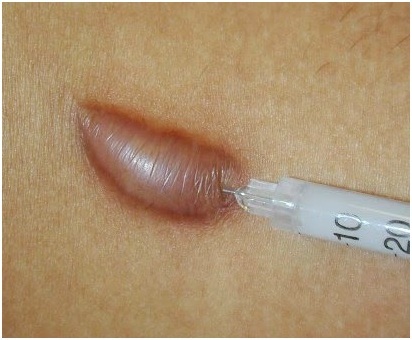 A keloid scar is sometimes confused with a hypertrophic scar. However, keloid usually grows beyond the borders of the original wound whereas in a hypertrophic scar the tissue stays within the wound border. People prone to develop keloid should avoid piercings, tattoos and unnecessary surgery. The exact cause is not known. It can develop after acne spots and boils, body piercings, burns, lacerations and surgical wounds. Infection increases the risk. There seems to be a problem with cells called fibroblasts which are responsible for the production of scar tissue . Hormones, problems with the immune system and genetic factors have all been suspected of being involved. 'Genetic' means that the condition is passed on through families by special codes called genes. Each cell of your body contains chromosomes which are made up of many genes. What is the treatment for keloid ? 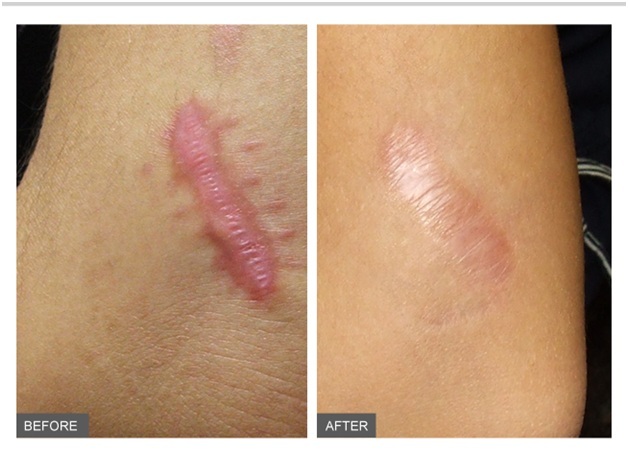 A keloid scar may shrink over time but rarely disappears completely. You may feel you can live with a small scar which is tucked out of sight. However, if you are concerned about its appearance, several treatments are available. No treatment is one hundred percent effective and you may be offered a combination of methods. A dressing which applies pressure and/or prevents air from coming into contact with the scar is used. The dressing must be used for 12-24 hours a day for many weeks. Preparations used are silicone as a gel or impregnated sheet, or polyurethane self-adhesive patches. Other products are available. For keloids on the earlobes (usually arising from piercings) compression earrings are recommended. They are usually used once the original keloid has been removed by surgery and have to be worn 24 hours a day treatment.